Michelle Andringa, Look , 'Spreading the art: Speeding collection images across the world', pg. 12-13, Sydney, Aug 2010, 12. Murray Bail, Sidney Nolan's Ned Kelly: the Ned Kelly paintings in the National Gallery of Australia , 'Ned Kelly, Artist', pg. 1-2, Canberra, 2002, 11, 16-19, 30, 31 (colour illus. ), 75. Michaela Boland, The Weekend Australian , 'Victorians let Kelly cross border', pg. 10, Canberra, 10 Apr 2010-11 Apr 2010, 10 (colour illus.). Michaela Boland, The Weekend Australian , 'Another Kelly replaces picture that went north', pg. 5, Canberra, 01 May 2010-02 May 2010, 5 (colour illus.). Michaela Boland and James Madden., The Weekend Australian , 'Sidney Nolan's marksman hits a record price', Canberra, 26 Mar 2010. Michaela Boland, The Weekend Australian , 'The refined politics of fine arts', pg. 12, Canberra, 27 Nov 2010-28 Nov 2010, 12. H. Brown, The Weekend Australian , 'Nolan's journey to paradise', pg. 8-24, Sydney, 21 Oct 1989-22 Oct 1989, 23. Wally Caruana and Jane Clark, The Cambridge companion to Australian Art , 'Buying and selling Australian art: a brief historical survey', pg. 290-306, Port Melbourne, 2011, 290, 306. Justin Coomber, Daily telegraph mirror , 'The larrikin genius dies', pg. 4-5, Sydney, 30 Nov 1992, 4, 5 (illus.). Peter Coster., Sun-Herald , 'Sydney Nolan painting of Ned Kelly expected to set Australian record at auction', Sydney, 16 Feb 2010, (colour illus.). Paula Dredge, Look , 'On target', Sydney, Mar 2017-Apr 2017, 32-33 (colour illus'. Adam Fulton., The Sydney Morning Herald , 'Record $5.4m for Nolan', Sydney, 26 Mar 2010, (colour illus.). W. Krüger., Art international [vol. 20, nos. 4-5] , 'Sidney Nolan in Moderna Museet Stockholm', Switzerland, Apr 1976-May 1976, (illus.). John McDonald, Bonhams magazine , 'Outlaw art', London, Summer 2017, 31 (colour illus.). Sandra McGrath, The Bulletin , 'Melbourne gives an Olympian salute to Nolan', pg. 78, Sydney, 16 Jun 1987, 78 (colour illus.). Brendan Trembath., The World Today with Eleanor Hall , 'Nolan's "First Class Marksman" hangs in Sydney', 31 Mar 2010. Interview features Edmund Capon, Eleanor Hall, Virginia Judge, Lou Klepac and Brendan Trembath. Staff writers., The Australian , 'AGNSW reveals mystery buyer of Sidney Nolan's Ned Kelly', Surry Hills, 31 Mar 2010, (colour illus.). A.M.: the Australian monthly , 'Ned Kelly Hangs Again', Sydney, Feb 1950, (illus.). Courier Mail , 'Artistic knight cherished his working-class origins', pg. 9, Queensland, 30 Nov 1992, 9. Foundation Newsletter #17 , Sydney, Dec 2010, (colour illus.). Photo has Lou Klepac standing beside painting. Look , 'Guided tours: highlights of the Australian collection', pg. 52, Sydney, Aug 2012, 52 (colour illus.). Article featured in 'What's on elsewhere'. Look , 'Barry Pearce's next book-call it "segueing with intent"'by Jill Sykes, pg. 28-29, Sydney, Mar 2012, 28. Look , 'Bullseye! ', pg. 15, Sydney, Jun 2010, 11, 15 (colour illus.). 50 something: National Seniors Association , 'Top Shelf', pg. 50, Brisbane, Jun 2010-Jul 2010, 50 (colour illus.). The Epoch Times , 'Kelly Hangs Again, This Time in Sydney', Sydney, 31 Mar 2010. Heide I: A guide book , Bulleen, 2002, 10. Common Wealth: A tribute to federation , Melbourne, 2001. 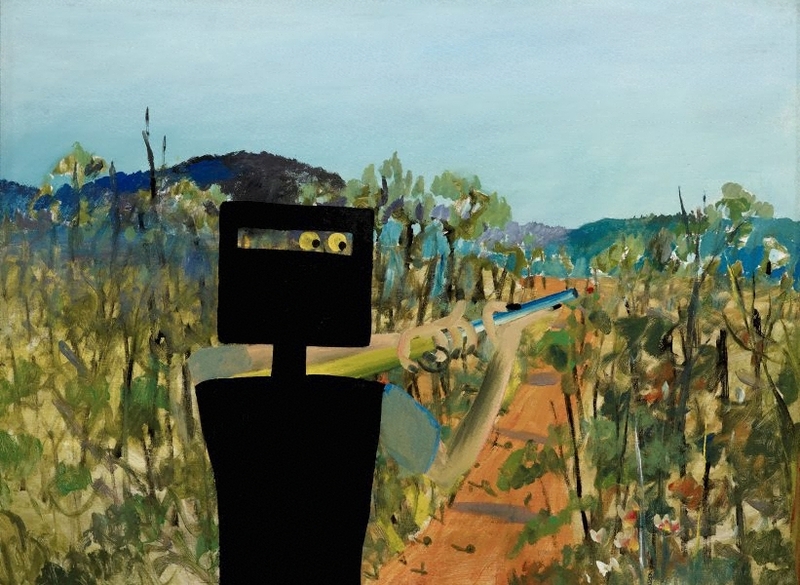 Sidney Nolan: the Ned Kelly story , New York, 1994, 28, 36 (illus.). Sidney Nolan - landscapes and legends: a retrospective exhibition 1937 - 1987 , Sydney, 1987, front cover (colour illus., detail), 76, 77 (colour illus.). Sidney Nolan: myth and imagery , London, 1967, 9.